We are now in month two of this unprecedented government shutdown, and I've started calling it what it really is - a lockout. We have thousands of dedicated public servants who want to work, who should be working, and who have jobs that are essential to the functioning of our government. But they can’t go to work because they’re locked out. In the DC region, we have more than 144,000 federal workers and contractors who are directly impacted, including over 53,000 Washingtonians. The longer this goes on and the more paychecks workers miss, the more dire the situation becomes. And it’s not just federal workers and their families who are impacted—it is the restaurant workers, child care providers, hair salons, and so many others. With less money and more economic anxiety, people in the region are spending less and we are seeing the effects throughout our regional economy. I sent emergency legislation to the Council to allow DC Government to provide much-needed unemployment insurance benefits to more federal workers. We committed $2 million in additional support from DC’s local contingency fund to the Department of Human Services for the DC Supplemental Nutrition Assistance Program (SNAP). This commitment ensures that despite the lapse in federal funding for SNAP, vital food assistance to tens of thousands of DC households and families will continue. And, yesterday, I announced that with the DC Housing Finance Agency we have launched a new program to provide mortgage assistance to District homeowners who are furloughed federal government employees. I will continue urging the President to work with Congress to get our government back open and our federal employees back to work. Until then, I want DC residents who are locked out of work to know that we have your back. Applications are now open for youth and employers who want to participate in the 2019 Mayor Marion S. Barry Summer Youth Employment Program (MBSYEP). 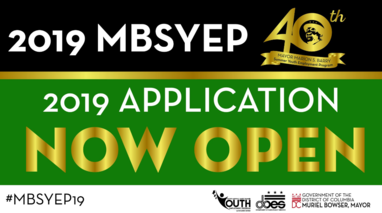 Until Saturday, February 16, District youth ages 14 to 24 and employers may apply online for MBSYEP 2019 at summerjobs.dc.gov. 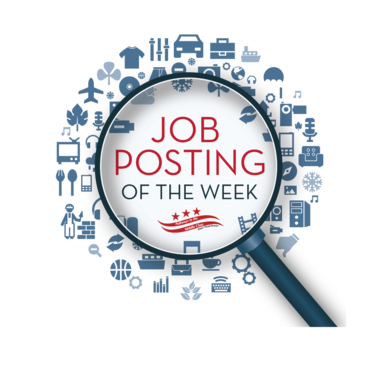 Learn more and apply at summerjobs.dc.gov. The Office of Unified Communications (OUC) has implemented a police non-emergency option. Residents and visitors of the District can now call 3-1-1 to report all police non-emergencies. The OUC defines a non-emergency call as any call related to an incident that does not pose an immediate threat to the safety of individuals and/or incidents that occurred at least one hour before the initial request for police assistance is made. 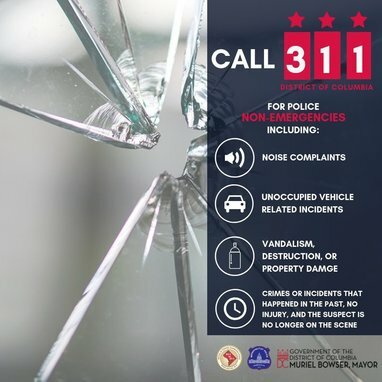 Now after dialing 3-1-1, callers should press Option #1 to report police non-emergencies like noise complaints, fender benders, vandalism, destruction of property, and for any crimes that have happened in the past with no reported injuries and when the suspect is no longer on the scene. Once the call is processed with the operator, based on the findings, the Metropolitan Police Department will be dispatched to provide a response. 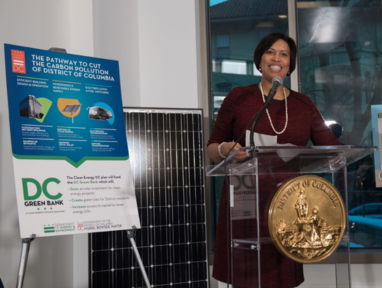 Last week, Mayor Bowser signed the Clean Energy DC Omnibus Amendment Act of 2018, codifying the District as the nation’s preeminent leader in clean energy and climate action by setting a mandate of 100% renewable electricity by the year 2032. This historic piece of legislation will bolster Mayor Bowser’s Clean Energy DC plan, which includes 57 action items for how the District will reach this ambitious target. Washingtonians are reminded that they have until January 31, 2019 to get covered and stay covered through DC Health Link. DCHealthLink.com, the District’s state-based health insurance exchange established under the Affordable Care Act, provides health insurance to more than 16,000 residents through the individual marketplace and more than 77,000 people through the small business marketplace. Until January 31, 2019, residents can go to DCHealthLink.com to shop for, compare, and enroll in affordable, high-quality insurance plans. This week’s District Minute features stories about the kickoff of the Mayor Marion S. Barry Summer Youth Employment Program, the signing of the Clean Energy DC Omnibus Amendment Act of 2018, and the Mayor's remarks at the National Action Network’s 2019 Dr. Martin Luther King Jr. Day Breakfast. The mission of the Department of Youth Rehabilitation Services (DYRS) is to provide court-involved youth the opportunity to become more productive residents by building on the strengths of youth and their families in the least restrictive, most home-like environment consistent with public safety. DYRS has an opening for a Recreation Therapist. This position is responsible for establishing, designing, and implementing an institution-wide recreational therapy program. All details regarding this vacancy, including qualifications, can be found by visiting the job announcement.